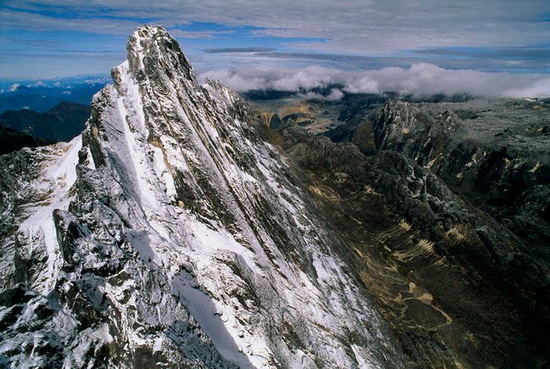 The world's tallest island is New Guinea, in the western Pacific, which rises 16.024 ft (4.884 m) from sea level to the top of Puncak Jaya Mountain. This island is the world's second largest island, after Greenland, covering a land area of 786.000 sq km (about 300.000 sq mi). New Guinea lies geographically to the east of the Malay Archipelago, with which it is sometimes included as part of a greater Indo-Australian Archipelago. The world's largest river island is Bananal Island. Bananal Island is a large island formed from the bisection of the Araguaia River, in southwestern Tocantins, Brazil. The island is formed by a fork in a very flat section of the Araguaia River. Bananal Island is 350 km (217 mi) long and 55 km (34 mi) wide. Its total area is 19,162.25 sq km (7,400 sq mi), twice the size of Lebanon or Jamaica. Google map. Samosir Island is a large volcanic island in Lake Toba, located in the north of the island of Sumatra in Indonesia. 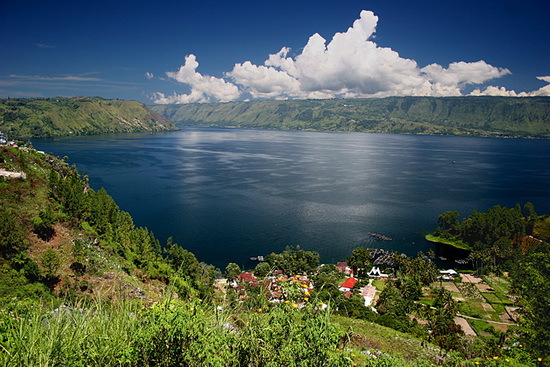 At 630 sq km (243 sq mi), Samosir is the largest island within an island, and the fifth largest lake island in the world. It also contains two smaller lakes, Lake Sidihoni and Lake Aek Natonang. This island is inhabited and it is a popular tourist destination due to its exotic history and the vistas it offers. Google map. There are several places where islands on islands in turn have lakes with islands – triple islands. 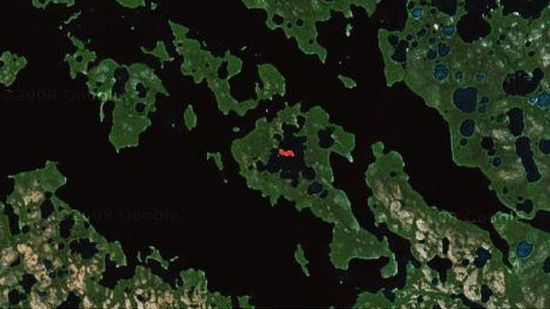 The largest island on an island on an island is a 4 acre (1.6 ha) island in a lake on an island in a lake in south-central Victoria Island, Nunavut, Canada, at 69.7928° North, 108.2411° West. Google map. Java is an island of Indonesia. With a population of 135 million, Java is the world's most populous island, and one of the most densely-populated places on the globe. Java is the home of 60 percent of the Indonesian population. 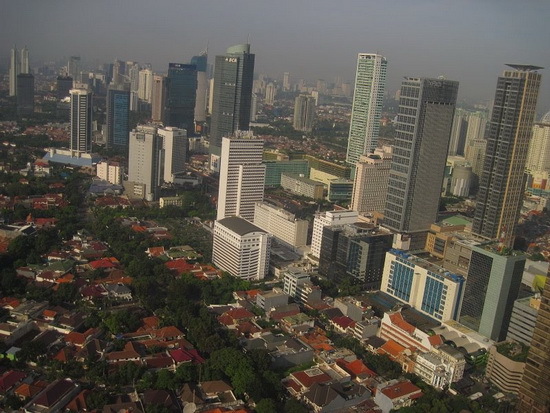 The Indonesian capital city, Jakarta, is located on western Java. 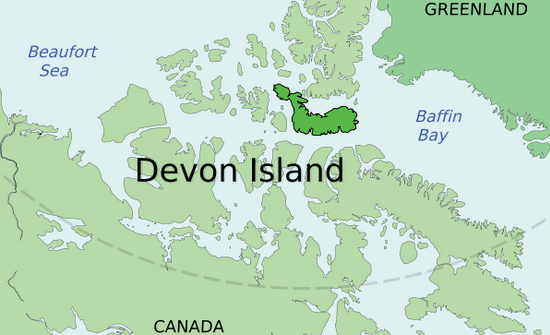 Devon Island is located in the Territory of Nunavut in Canada. It is the largest uninhabited island on Earth, with a surface area of approximately 55,247 sq km (21,331 sq mi). Because of its relatively high elevation and its extreme northern latitude, it supports only a meagre population of musk oxen and small birds and mammals. 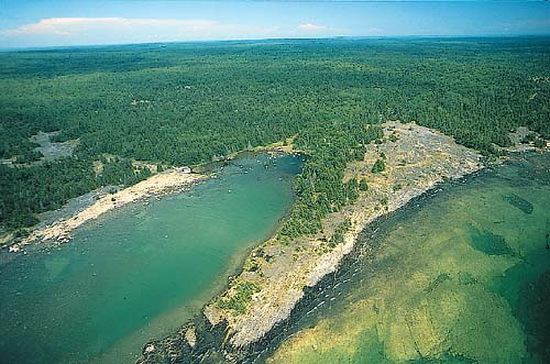 Manitoulin Island, the largest lake island in the world, separates Lake Huron from the Georgian Bay and forms the North Channel, one of the most highly regarded waterways in the world. This island is home to pristine forest, dramatic landscapes of the Cup and Saucer nature trail, and crystal clear lakes. It is an area with a rich history and culture, with many First Nations reserves. The island has an area of 2,766 sq km (1,068 sq mi), making it the 172nd largest island in the world, and Canada's 31st largest island. Google map. 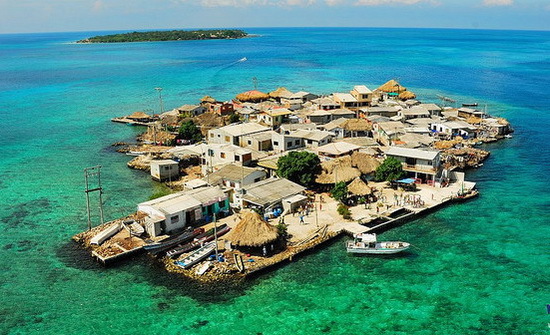 The most densely populated island in the world is Santa Cruz del Islote, a microslum off the coast of Colombia. This tropical island is located in the emerald waters of the idyllic Caribbean, though is packed so tight that most activities are done off island. The residents have to use neighboring islands as cemetery, recreation grounds, and the residents work on the mainland instead of on the island. The students attend school on neighboring mainland. The Mucura Island Hotels are a prime source of work for the residents. Its incredibly small size (approximately 0,12 sq km or 30 acres) results in it being the most densely populated island on Earth. This island has about 1.200 inhabitants. Google map. Located 2.400 km (1.490 mi) southwest from Saint Helena lie the remote islands of the Tristan da Cunha Group, consisting of the five islands of Tristan da Cunha, Inaccessible Island, Nightingale Island, Middle Island, and the Stoltenhoff Islands. It is the most remote inhabited archipelago in the world, lying 2,816 km (1,750 mi) from the nearest land, South Africa, and 3,360 km (2,088 mi) from South America. Actually, only the island of Tristan da Cunha is inhabited, making it the most isolated of all the world's remote island communities. 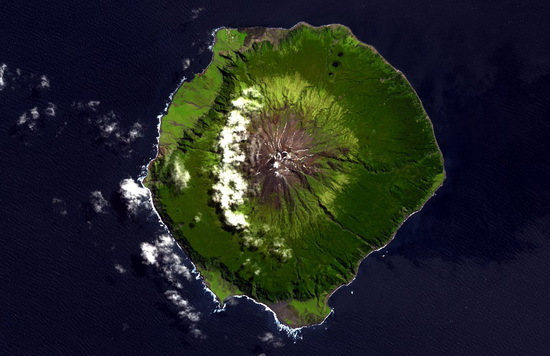 The island of Tristan da Cunha forms a circular-shaped volcanic cone with a circumference of 34 km (21 mi), measuring 10 km (6 mi) in diameter, with an area of 98 sq km (38 sq mi). Google map. The most northerly island, and the northernmost point of land in the world, is Stray Dog West island at 83°40′N 30°31′W, off the north coast of Greenland. It was not discovered until 2007, and is north of Oodaaq Island, the previous holder of the record. 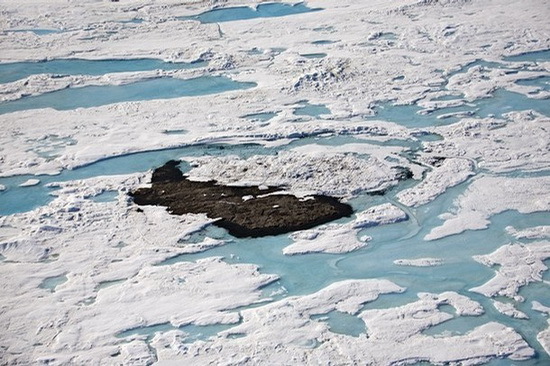 Stray Dog West belongs to a shifting, semi-permanent archipelago locked in the sea ice north of Peary Land in northeast Greenland, named the Stray Dog Islands. The first island of the archipelago was discovered in 1996 by Dennis Schmitt and Bob Palais. Google map.